Discussion in 'Videocards - AMD Radeon' started by OnnA, Jul 9, 2016. Nobody is looking at the Linux driver, as if it isn't AMD that's writing it, or that it doesn't effect anything. Since the days of AMDGPU the Linux driver is basically a reflection of the Windows driver that had to be submitted earlier, just because of the approval requirements of the kernel. AMD is moving to a unified driver for both Linux and Windows. Vega probably has the most driver development pre-release than any other AMD GPU. This is going to be very interesting. Yea lets have 2006-2008 all over again. That was the absolute worst era of GPUS for anyone who is not a rabbid ignorant fanboy. Nvidia just has a bigger following or blind sheeple like Apple. I use both sides in all of my rigs. Ironically, my AMD has the least bit of trouble. The fact nvidia control panel lags on a 550mb read SSD is effin pathetic. Cant wait for vega. I really wanted to do a 6c/12t ryzen build but Ill just keep what I have for now and get a new gpu. Ill get the Ryzen refresh. It's really sad when people actually like monopolies. I wish that it wasn't only AMD going against both Intel and NVIDIA at the same time, because loving a free market seems to immediately make us AMD fanboys or something, which is gross. I don't care about any damn company, just my performance/dollar, and that's not getting any better with monopolies around. If someone thinks ATI is Grade B, it's his point of view :cyclone: nothing to worry about. You might recall that in October 2015, Microsoft announced the acquisition of Havok, the historic company behind the most used physics middleware in the gaming industry. At that time, Microsoft hinted that Havok’s middleware would be integrated into developer tools such as the DirectX 12 API.
" As we welcome Havok to the Microsoft family, we will continue to work with developers to create great gaming experiences, and continue to license Havok’s development tools to partners. We believe that Havok is a fantastic addition to Microsoft’s existing tools and platform components for developers, including DirectX 12, Visual Studio and Microsoft Azure. Havok shares Microsoft’s vision for empowering people to create worlds and experiences that have never been seen before, and we look forward to sharing more of this vision in the near future." Well, it’s not exactly the near future since it’s been a year and a half since that announcement. We could be finally closing in to the reveal, though, possibly at E3 2017, with Microsoft trademarking Direct Physics. A Direct Physics API integrated into DirectX 12 could potentially do wonders in helping game developers, with physics simulations constantly getting more complex in games nowadays. With DirectX 12 now being used on both Xbox One and Windows 10 PC, one also has to wonder how this could help Microsoft’s upcoming Scorpio console. We already know that DX12 has been integrated into the commander processor of the GPU for maximum efficiency. Curiously, this is not the first time that the Microsoft floated the idea. In fact, back in 2006, there was a job posting for a Software Design Engineer that would join the “Direct Physics” team.The Windows Graphics and Gaming Technology group is looking for a software design engineer to join a growing team responsible for developing Direct Physics. This team is responsible for delivering a great leap forwards in the way game developers think about integrating Physics into their engines. Physics and real time, accurate simulation is a key part of the next generation gaming experience, bringing increased realism, greater immersion and more interesting experiences. That evidently didn’t work at the time but with Havok’s expertise, Direct Physics could become a reality very soon. Stay tuned to Wccftech for any official announcements. that's at 1080p, gonna be interesting to see how it is at 4K..
Haha. What game is that. Some people will get more monitors, some will want 4k monitor eventually (photographers/amateur movie makers), 2nd gen VR might appear next year (possibly higher res and/or wider FoV).. All this stuff will push for more demanding performance requirements. I hope AMD has some answer for this, just hope the pricing isn't too far off (I've felt 1070 and 1080 on release were being asked too much for what they had to offer). Big VEGA? and Small VEGA? AMD is releasing multiple variants of Vega, and there is a possibility that this particular benchmark is of a cut down chip that is meant to go head to head with the GTX 1070. The device ID used in this case is 687F:C1, and while the first 4 digits are the same, the last digit is actually different from the ID we usually catch: 687F:C3. 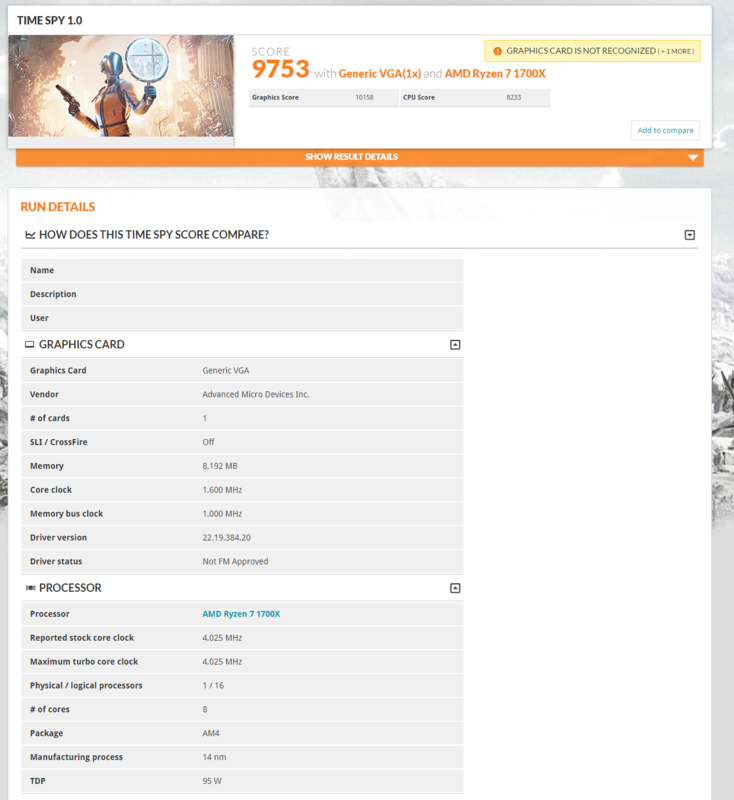 No urls for the 3DMark scores? Why we don't have Big Polaris with HBM? couldn;t they just use old HBM1 from fury with an improved polaris architecture? just to fill the gap between vega and 480/580? what does the nm fabrication has to do with memory? The real question is why didn't they just release a big Polaris chip with double the Compute Units? They could have probably hit GTX 1080 levels of performance just from that alone. Probably because they didn't have the money to with Ryzen launching. Financial responsibility. Transistors cost money. MHz does not. AMD can make huge GPU which will counter best nVidia has ant time they want to. But cost of that GPU will not be profitable. nVidia simply hit jackpot with clock this time around. And AMD was smart enough not to fight them at cost of bleeding money. Developing huge GPU just to sell some twenty thousands units at minimal profit is quite foolish. Selling stuff like RX470/480 where AMD delivered good performance for money... At reasonable cost of developing and good profitability. AMD is not bleeding money by not fighting battles with low return value. They are smart, if they invest into something, they believe it will be successful. Hbm1 wasn't really an option for amd unless they went with 8 stacks, which would be very expensive , they would also need more memory controllers. either that or only 4gb of memory which would be a problem. I assume nvidia had a similar problem, hbm2 wasn't gonna be ready or cheap enough in time for 2016 so they opted to make the gp 102 along side the gp100. Imo Amd decided to wait for hbm2 availability because they need less stacks to acheive the same bandwidth as hbm1,could have 8gb of memory, have fewer memory controllers, and have more time to develop and refine the design. This (in theory) could reduce the cost of the end product, have a potentially better product on launch day and launch on an odd year where possibly nvidia can't respond quickly.